Nothing is better for comedy than unexpected disaster. So it worked out well to have a power outage that made Seattle Opera’s headquarters and rehearsal studio (in the South Lake Union neighborhood) dark and cold today, just in time for the first day of rehearsal of The Barber of Seville! The singers were good-humored about it, even one who arrived with luggage, directly from the airport, after getting bumped from a flight yesterday. And it turns out that you don’t need electricity to rehearse an opera: great performers make their own chemistry. After all, live music sounds the same in the dark as it does in the light. The amusing situation--with little battery-powered lights on the music stands, courtesy of the stage management department, and winter coats and sweaters that went back on as the rehearsal studio lost heat--set an appropriate tone for opera’s ultimate sit-com. Laughs aplenty were had, and more were promised for the weeks to come. 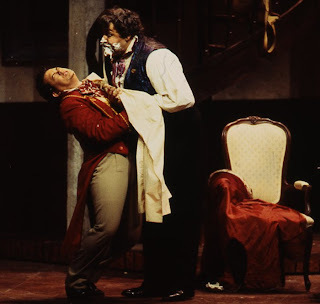 Photo: Bartolo (John Del Carlo) tries to blow a piece of lint out of Figaro (Earle Patriarco)'s eye in Seattle Opera's 2000 Barber of Seville, but ends up spitting shaving cream every which way. Gary Smith, photo.